Takeaway: WRITELOG waits are associated with a busy or slow transaction log. To tackle these waits, we need to measure transaction log activity. 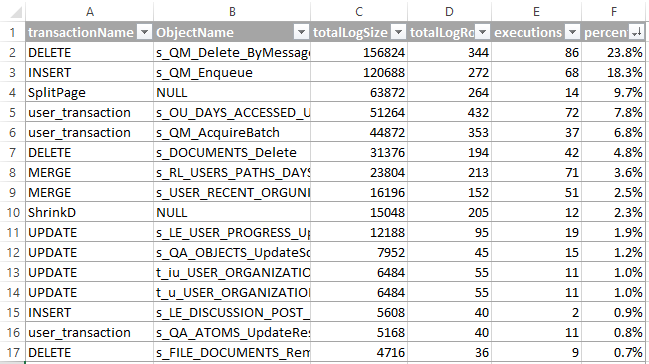 I describe a lightweight way to examine transaction log usage for busy OLTP systems. Start with Microsoft’s Advice: I’m not going to introduce the topic of transaction log performance. Microsoft’s SQL Customer Advisory Team already provides a great introduction with Diagnosing Transaction Log Performance Issues and Limits of the Log Manager. Their advice includes watching the “Log Bytes Flushed/sec” performance counter found in the “SQL Server:Databases” object. Reactive Efforts: If you’re curious about transaction log activity for open transactions, Paul Randal has a script at Script: open transactions with text and plans. Spiky Activity: It’s not too difficult to find infrequent activities that write a lot of data to the transaction log; activities like data warehouse ETLs, or index rebuilds. Use a trace or extended events to look for statements with large values for “writes”. 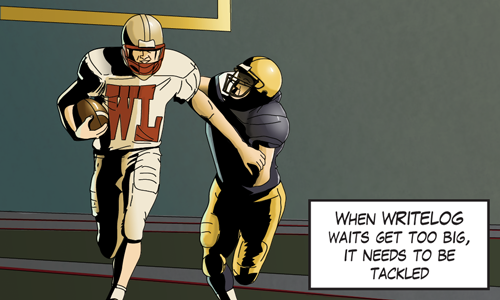 WRITELOG waits are a scalability challenge for OLTP workloads under load. Chris Adkin has a lot of experience tuning SQL Server for high-volume OLTP workloads. So I’m going to follow his advice when he writes we should minimize the amount logging generated. And because I can’t improve something if I can’t measure it, I wonder what’s generating the most logging? OLTP workloads are characterized by frequent tiny transactions so I want to measure that activity without filters, but I want to have as little impact to the system as I can. That’s my challenge. Erin also pointed out that the UI warns you that it’s a very high volume event. So to avoid that kind of volume, I got the idea to read straight from the transaction log and combine that with a lighter extended events session to get the SQL text. The transaction_id captured by the extended events session corresponds to the XAct ID column in fn_dblog. The details for this script are kind of fussy, but it all comes together in a solution that won’t drag a server down. Care is still recommended; start with 10 seconds and go from there. Here’s an example of what the results would look like. It’s an aggregated view of all transaction log activity in a database for 10 seconds. Notice that the session is database specific. That’s because transaction logs are database specific. To help focus on the right database, use the “Log Bytes Flushed/sec” performance counter found in the “SQL Server:Databases” object. Also notice that I’m tracking ObjectIds. That’s because we use procedures quite heavily. You may want to adapt this code to use query_hash instead. In both cases, collecting the statement text is not recommended. The sample of data is limited by the size of the extended events target file or the duration variable, whichever is smaller. @sqL_handLe pointed out to me that reading the log using fn_dblog will prevent the transaction log from truncating. Reading from the transaction log can be very tricky to do efficiently. Luckily we can use the sp_replincrementlsn trick to get LSN parameter values for fn_dblog.